What Can Content Do For YOUR Business? In recent years, the way people buy has changed. Arguably, the biggest shift is the move towards self-education. Right now, your customers are searching online, browsing social timelines, reading in-depth articles, downloading e-books, cheat sheets, and checklists, and asking questions to help them boost their knowledge, and make more informed buying decisions. This trend means if you’re NOT publishing content – you risk harming your sales and undermining your expert positioning, because your audience will go elsewhere. Fortunately, it’s not too late to get started with content marketing. But if you want results, you can’t rush to publish any old content. Content marketing is the art of publishing great content to fuel your sales funnel, help you find and keep more of your perfect customers, and position your expertise so you can charge what you’re worth. Instead you need to invest time and resources to craft quality content that serves a purpose, expresses your personality, and gently nudges prospects along your sales journey. If you do all of the above, then you’ll begin to position yourself as a knowledgeable, likeable expert. In turn, you’ll find if people like your voice, they’ll be willing to join your list to discover more… perhaps even buy from you. But how can you publish content that gently nudges a stranger into a loyal customer? The secret is to create content that aligns with your visitor’s knowledge quest. 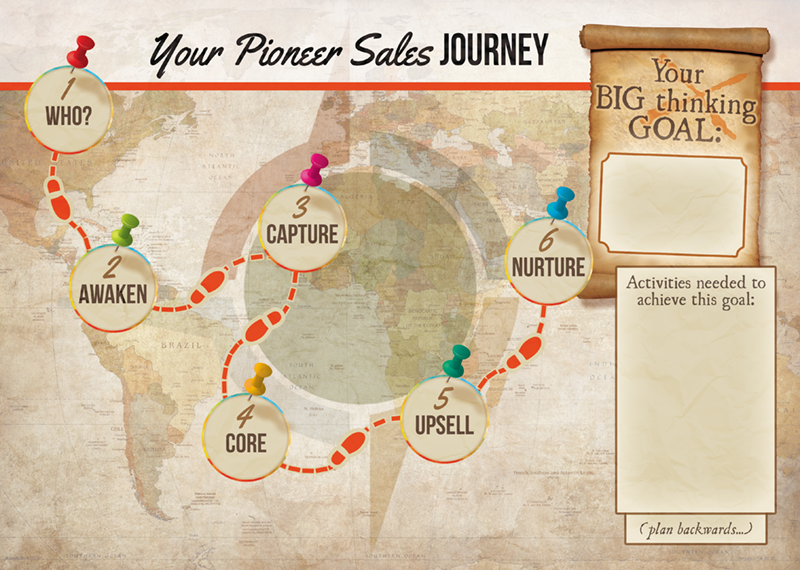 I call this the Pioneer Sales Journey. There are six steps to this content-driven journey. For content to be effective, it must appeal to your target audience. It’s no use writing about the stuff that you know; if your customers aren’t interested in consuming it. It’s for this reason you must create an in-depth customer avatar, or you’ll risk writing for a generic everyone – and appealing to no one. Once you know your perfect customer’s hopes, fears, desires, and challenges, you’ll be able to share what you know in a way that’s more relevant, interesting, and compelling – instead of contributing to the online noise and overwhelm. So don’t be tempted to skip this important step. Yes it can feel like hard work, but it’s worth it. And to help you get started, grab a free customer avatar template at www.gemwriting.co.uk/customer-avatar. 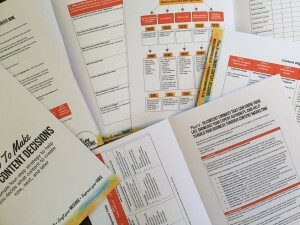 This handy resource is chock-full of questions and plenty of room for you to write your ideas. Once you know your perfect WHO, you have a sound basis for creating attention-grabbing content, which kick-starts a profitable relationship. People are proactively looking online for information to help them make good buying decisions. If you address the right stuff, it WILL get read – because your audience is looking for it. And that’s the first job of your free content, to entice your perfect WHO to stop by for a closer look – and to fall in love with your voice. But beware… at this early stage in your relationship, hold back from the hard sell – that will be a turn-off. 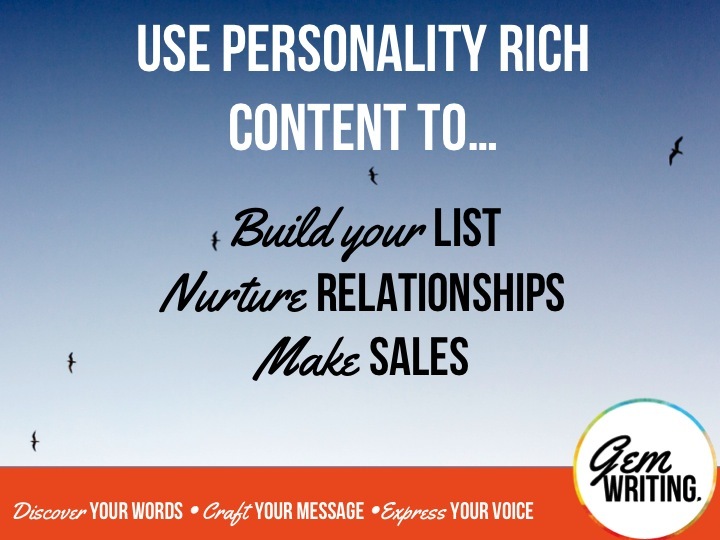 Instead craft content that helps and let your personality shine through. Your authentic voice is important as you build your ‘know, like, trust factor’ with your audience. You have lots of creative freedom here. For example, you could invest in blogs, articles, infographics, or podcasts. Done well, these can become valuable business assets helping get the right eyes on your business (and its message) while earning you that all-important attention. When you become a customer’s trusted source of information, it’s your message that gets turned up – not switched off. Then when your customer is ready to take the next step, you’re more likely to be their number one choice due to the strong foundations laid by your content. It’s NOT easy to get the right eyes on your content. As the internet becomes noisier, your customers face information overload. As a result, people are choosier over who gets their attention, they’re unsubscribing from lists, and thinking twice before signing up (to avoid that inevitable flood of follow-up emails). Which poses the BIG question: How can you ensure your message is turned up and not switched off? Whilst it’s lovely to have an audience who are reading your content, you need to monetise this attention. A lead magnet is information of high perceived value, locked behind an opt-in form. The deal is you exchange this valuable content for contact details. Then armed with this data, you can nurture the relationship to the next step through targeted follow-up. A lead magnet can take many forms. For example, I’ve used checklists, daily email tips, and e-books (to name a few). The trick is to decide what will entice your audience to part with their details. The capture process works, because it encourages people to make a micro-commitment. What’s more, you’ll begin to build a list of warm leads who are no longer an invisible member of your audience. One more thing… Make your lead magnet content so good, that your subscriber digests and implements its contents. This will strengthen your relationship and build your audience’s desire for more. Want to get a better return on your content marketing by creating content that delivers results? If so, check out my NEW, 26-page printed workbook that reveals 28 different types of content and explains where and how to use in your sales journey to build profitable relationships, grow your list, and make more sales. When a subscriber joins your list, the next step is to entice them to buy – even if their investment is small. Firstly, the relationship shifts when a prospect becomes a customer. But that’s no surprise. Cash has exchanged hands, which means the buyer has more incentive to give you their attention. Secondly, you’ll find it far easier to sell to someone who’s already bought from you – simply because they’ve had the experience of making a transaction in the past. So that first sale paves the way for more profits in the future. Content will reduce the friction and your lead magnet has laid foundations. Now follow up with a value packed autoresponder series and an irresistible offer, to entice your subscriber to the next step. Words matter. 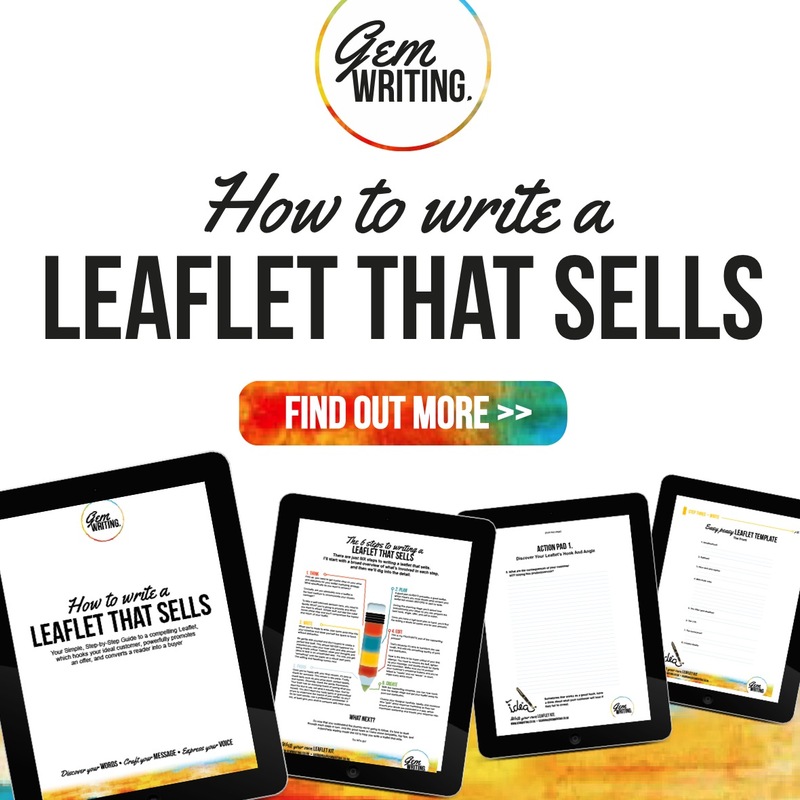 Don’t miss the 14 ingredients of a successful campaign by downloading a free checklist at www.gemwriting.co.uk/marketing-checklist. Once a subscriber has bought something, the next step on their journey is to upgrade to your premium offer. Not everyone will do this – remember the 80/20 rule? Remember, it’s easier to sell to a customer than a prospect. So think carefully about the next logical step in your sales funnel. What topics and types of content can you create, to encourage the people on your list to upgrade to a premium product? The final stage of the Pioneer Sales Journey is to nurture profitable relationships by encouraging a customer to buy from you again, and again, and again. Not only is this great for your bottom line, but your reputation too. 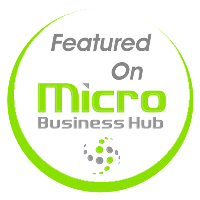 Happy customers will refer you and help to establish you as the ‘go-to’ in your niche. Of course nurture isn’t all about the sales. It’s also about the positive impact you can make to your perfect WHO. So be sure to stay in touch – but not just to sell. Instead, continue to add value – or your customers will go elsewhere and your list will dwindle. People like to feel in control of their buying decisions. Of course your offers, marketing, and content can influence, but there’s a big difference between a pushy sale and a welcomed purchase. So while your relationship-building content can make invitations, don’t screw up your hard work by turning people off with ‘salesy’ sleaze! As you can see, content marketing is a powerful tool that can boost your expert profile, help you find and keep customers, and provide the means to build profitable relationships with your perfect WHO. For best results you must take the creation of content seriously. So discover your words, craft your message, and express your voice. Use your personality and your expert knowledge to awaken your audience and be a force for good. Make a positive difference to the lives of your perfect WHO – and grow your business as a result. Content is the fuel that drives your visitor’s online journey. For best results, it pays to strike a careful balance between relationship building, authority positioning, and sales prospecting. There are at least 28 different types of content, which you can use to nurture a prospect through your sales journey. The trick is to decide what content will work best for your specific goal. This is the question I address in my new workbook – How To Make Smart Content Decisions. To discover more and order your copy, simply click here. Download 99 writing prompts and discover how to write with personality. Georgina is a freelance copywriter and content marketing consultant. She is qualified through The Institute of Copywriters, and experienced in various industries. Also trained in NLP and life coaching, Georgina knows what motivates people to take action and how to influence behaviour. Georgina is passionate about helping experts, business owners, and entrepreneurs discover their message and express this through content that connects. Gem Writing Ltd t/a Georgina El Morshdy & Gem Writing: 1a Eddystone Road, Wadebridge, Cornwall, PL27 7AL, England.